This article originally appeared at Portside.org, by Holly Near. When the students at Kent State were killed and then the violence and killings later the next week at Jackson State, I was doing Hair on Broadway in New York City. Hair was an antiwar musical reflecting the discontent and confusion that invaded society as a result of violence and racism. We protested the Kent murders the evening of May fourth by refusing to sing the finale, “Let the Sun Shine In,” and instead invited the audience to participate in a silent vigil. 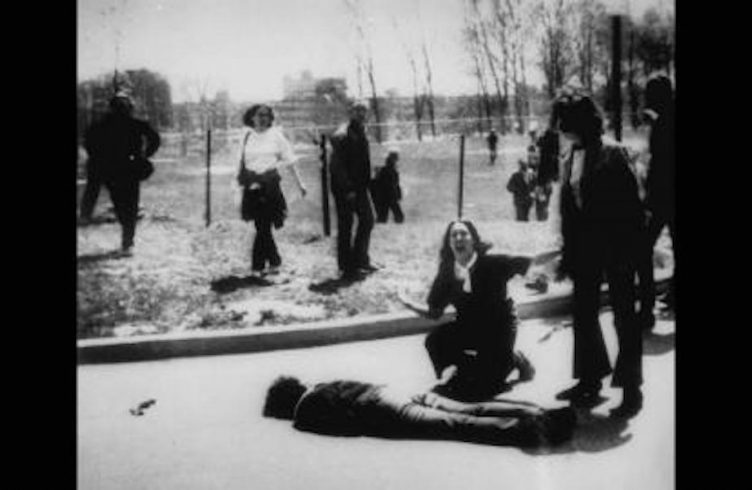 A few years later, I was invited to write and sing a song for a Kent State memorial at which I joined Ron Kovic, Jane Fonda, Dan Ellsberg, Judy Collins, and many other long-time activists who gathered there. The song has grown over the years, new verses being added as violence continues to interrupt human potential. We grow the whole world round. El pueblo unidojamds sera vencido. This book was originally published as a special issue of Viet Nam Generation: A Journal of Recent History and Contemporary Culture (Volume 2, Number 2) 1990. ISSN: 1042-7597.